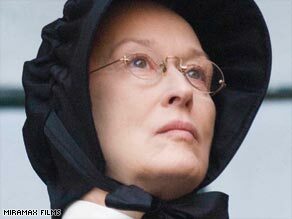 Director John Patrick Shanley was "quite astonished" by Streep's acting in "Doubt"
Shanley on shooting: "The set became like the ring that prizefighters go into"
LONDON, England (CNN) -- If you had to describe one Hollywood actress as "heavyweight" Meryl Streep would be a pretty strong contender for the title. Pulling no punches: Streep as fiercely caustic nun, Sister Aloysius in John Patrick Shanley's 1960s morality drama "Doubt." Over 30 years in the movie business the actress has pulled no punches, receiving an incredible 15 Oscar nominations, and winning twice, for "Sophie's Choice" in 1982 and "Kramer Vs. Kramer" in 1979. Even so, "Doubt" director John Patrick Shanley says was knocked sideways by Streep's "tooth and nail" performance in his Oscar-nominated drama, "Doubt," describing himself as "quite astonished." Streep, who has been nominated for a Best Actress award at this year's Academy Awards for her role, stars as fiercely caustic nun, Sister Aloysius, the iron-gloved principal of a religious school in a working class New York neighborhood in the 1960s. "Meryl really wanted to do the role because, I think, she thought it was really right for her," Shanley told CNN in a recent interview, adding, "I have to say I was quite astonished at her amazing facility." But it was the rapport between Streep and Oscar-winner Philip Seymour Hoffman who plays Father Flynn that was central to getting the story across. Shanley says their relationship was electric. All he had to do was put them on set and wait for the sparks to fly. "The set became like the ring that prizefighters go into," recalls Shanley. "They would just sit in their respective corners when they weren't shooting, with their heads hanging down, in some private universe of some very, very tormented place, and get ready to do that scene. "And then when they were called to do it, they would get in there and the walls would shake." Shanley approached Streep first when he was casting the film, but knew he would need to find a formidable actor to play the Father Flynn, which is why he chose Hoffman -- "the smartest guy that chose to become an actor that I've ever met." "I knew that when I closed my eyes, I didn't know what he would do with the role," Shanley told CNN, "I knew that if I didn't know then Meryl wouldn't know and that would keep her on her toes." Hoffman's portrayal of Flynn, the modern-thinking humanist whose progressive sermons and personal habits -- like an enjoyment of three sugars in his tea --rankle austere Aloysius, has won him an Oscar nomination for Best Supporting Actor. The story is set in the Bronx, New York in 1964 just after the Kennedy assassination and on the cusp of the civil rights movement -- a time of social flux. It centers on a moral crusade Sister Aloysius launches against Flynn who she suspects of taking an unhealthy interest in Donald Miller, his altar boy and the school's only black student. The film begins with a simple question: did he or didn't he? The ensuing battle between Aloysius and Flynn is old against new with religious, ethical, political, gender and racial elements all thrown into the mix. Shanley's mantra during filming was to never lead the audience to any one conclusion, allowing people to view the tale through the reflection of their own biases. It was hard to get this delicate balance in emotionally intense scenes but, says Shanley, with actors of Streep and Hoffman's caliber his approach was to use a very light touch. "It's often just nuance," he told CNN, explaining how he and Streep worked together while filming one of the film's confrontations. "We were in the middle of it and Meryl was going with Phil tooth and nail and she got very sarcastic with him. "And I said 'Cut' and said 'Ok, we have that. Now let's do it again and this time take the high road.'" "And she did every single thing differently and yet within character and she took the high road at every turn." He says Hoffman takes direction in a completely different way. "With Phil, you give him information and it goes through a pipeline about a quarter mile long and then it shows up, and how it shows up, I don't know. "I don't know what that process is exactly. He's a very internalized actor but he hears everything you say and he makes his adjustments accordingly." "Doubt" is based on a Tony award-winning and Pulitzer prize-winning play also written by Shanley, which the director adapted for the big screen. Shanley, who won an Oscar for Best Original Screenplay in 1988 for "Moonstruck," has been nominated for Best Adapted Screenplay. As well as Streep and Hoffman's, there are Best Supporting Actress nominations for Amy Adams who plays a mouse-like, innocent nun who teaches at the school, Sister James, and stage actress Viola Davis who plays Donald Miller's mother.